American lawyer and jurist; son of Bennett and Bertha Cowen; born in Houston, Texas, Dec. 12, 1861; received his early education in the public schools of Texas and California, and in a private school in New York city. He then studied seven years in Germany, and, returning to Chicago in June, 1881, received the degree of LL.B. from the Northwestern University, being admitted to the bar Jan. 4, 1883. 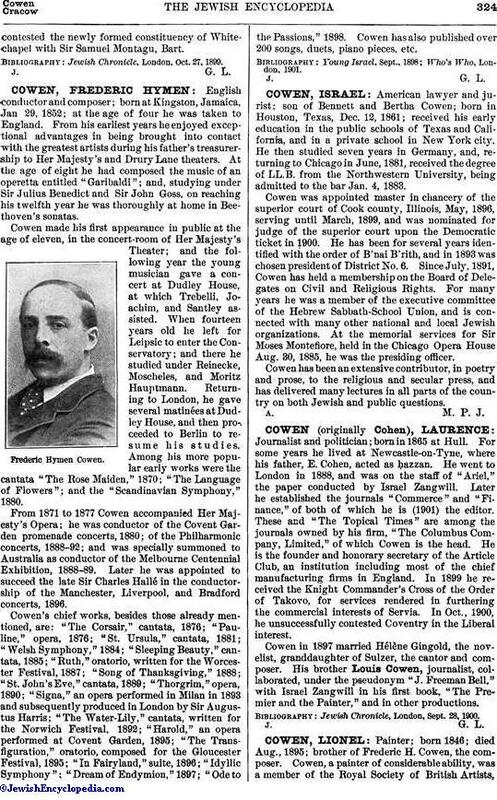 Cowen was appointed master in chancery of the superior court of Cook county, Illinois, May, 1896, serving until March, 1899, and was nominated for judge of the superior court upon the Democratic ticket in 1900. He has been for several years identified with the order of B'nai B'rith, and in 1893 was chosen president of District No. 6. Since July, 1891. Cowen has held a membership on the Board of Delegates on Civil and Religious Rights. For many years he was a member of the executive committee of the Hebrew Sabbath-School Union, and is connected with many other national and local Jewish organizations. At the memorial services for Sir Moses Montefiore, held in the Chicago Opera House Aug. 30, 1885, he was the presiding officer. Cowen has been an extensive contributor, in poetry and prose, to the religious and secular press, and has delivered many lectures in all parts of the country on both Jewish and public questions.